January 16 ~ Is Purgatory Real? 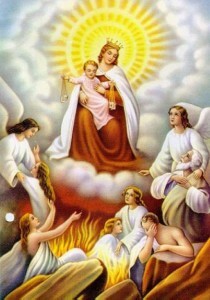 The Catholic Church’s stance on Purgatory is that it is a time or place of purification before going to heaven. The work of redeeming the soul has already been done by Jesus on the cross. But the reparation for sins committed and forgiven is the purpose of Purgatory. As I sat in the terminal waiting for our delayed connecting flight on the last leg of our trip, I felt angry that so many people (my husband and me included) had been so grossly inconvenienced. Our airline tickets hadn’t been cheap, and we should have been treated much better – in fact, catered to – for the price that we had shelled out to travel by plane. The airline should have been more organized, planned ahead for potential delays and bad weather, the planes should have been cleaner, the airport food should have been cheaper, and the flight attendants shouldn’t have been so snippy. After all, we were the customer, and the customer is always right.